Well, summer has officially set in in Texas. Oh my! I start sweating just thinking about the heat!!!! However, in all this summer heat comes more work. More work that won’t wait until cooler weather. More work that demands we take action NOW, dang it! For instance, we ordered chicken plucking “fingers” (which don’t even resemble fingers at all) so that the Handsome Hubby can rebuild our chicken plucker. Handsome Hubby doesn’t want to pluck 50ish chickens by hand! I don’t know why! So, THAT has to be done this weekend so we can butcher next weekend. Yes. It’s FINALLY time. Then, in another 3 weeks, it will time for round 2. Of course, round 2 will be much smaller. We need to clean the coops out. Both of them. Again. Chickens are some of the nastiest things I’ve nearly ever seen. The garden needs tending to. BADLY!!! We need to pick whatever’s out there. Which consists of several different things. That means canning. We are going to have to can whatever we pick. And then we dry. Just look at the tomatoes I dried last weekend!!! Don’t they look YUMMY!!!! I can’t wait to use them!!! How’d we do that? Easy peasy! You just slice the maters (in half for the small ones. 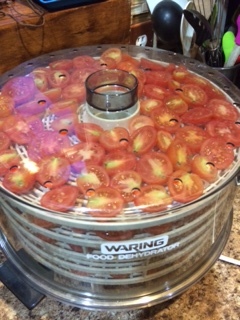 If they were larger, I may have made 2 slices) and then fill up the trays on the dehydrator (get them super close together and shove as many maters as you can on a tray cause once they dry, they will shrivel and it won’t look like anything is on the tray!) Once you get as many as you want/have, just set the trays up and plug it in! Away you go! Don’t forget to rotate the trays once a day so the bottom tray is now the top, ect. so that the maters will dry at the same time! We just Use a plastic baggy to store them in. However, this year, we may put em in a jar! That’d be pretty! 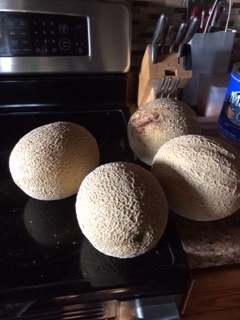 I finally got some cantaloupe from the garden! They are so sweet, feels like they’ll rot your teeth just looking at them! I’d show you a pic of the garden, but it looks wild and wooley out there! Maybe a before and after pic, once I actually get it cleaned up and weeded! 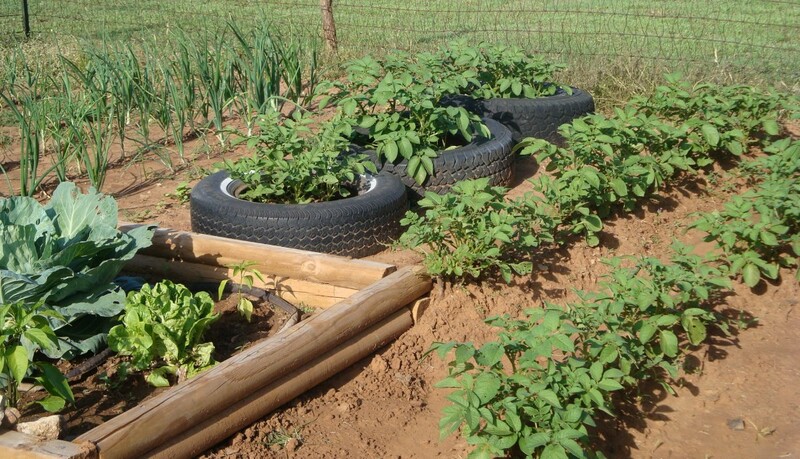 We are also needing to prepare the garden for the fall crop. What are you planting this fall? It’s too dang hot to even think. This post may ramble. It may not. Don’t judge. I’ve been sick and sweating my behind off lately.